-- None -- 305 Lincoln Road (Main Station) Miami Beach, FL 33139 1 South Beach - 2341 Collins Avenue A/C Marriott - 2912 Collins Ave. Alexander - 5225 Collins Ave. Aloft South Beach - 2360 Collins Avenue Angler's - 660 Washington Ave. Aqua - 1530 Collins Ave. Astor - 956 Washington Ave. Atlantic - 3400 Collins Ave. Avalon - 700 Ocean Dr. Barbizon - 530 Ocean Dr. Bay Breeze - 6600 Collins Ave. Beach Paradise - 600 Ocean Dr. Beach Plaza - 1401 Collins Ave. Beachcomber - 1340 Collins Ave. Beacon - 720 Ocean Dr. Bentley - 510 Ocean Dr. Best Western - 4101 Collins Ave. Best Western - 9365 Collins Ave. Betsy Ross - 1440 Ocean Dr. Blue Moon - 944 Collins Ave. Boulan - 2000 Collins Ave. Bikini Hostel - 1255 West Ave Breakwater - 940 Ocean Dr. Burleigh House - 7135 Collins Ave. Bus Stop - 21st St & Collins Ave. Cadet - 1701 James Ave. Canyon Ranch - 6801 Collins Ave. Cardozo - 1300 Ocean Dr. Carlton - 1433 Collins Ave. Casa Claridge's - 3500 Collins Ave. Casa Grande - 834 Ocean Dr. Casablanca - 6345 Collins Ave. (Castle Beach) Castillo Del Mar - 5445 Collins Catalina - 1732 Collins Ave. Cavalier - 1320 Ocean Dr. Century - 140 Ocean Dr. Chelsea - 944 Washington Ave. Chesterfield - 855 Collins Ave. Circa 39 - 3900 Collins Ave. Claremont - 1700 Collins Ave. Claridge - 3500 Collins Ave. Clay - 1438 Washington Ave. Clevelander - 1020 Ocean Dr. Clifton - 1343 Collins Ave. Clinton - 825 Washington Ave. Colony - 736 Ocean Dr. Comfort Inn Oceanfront - 1238 Collins Ave. Congress - 1052 Ocean Dr. Continental - 1825 Collins Ave. Copa Bella - 5025 Collins Ave. Courtyard Marriott - 200 SE 2nd Ave. Courtyard Marriott - 1530 Washington Ave. Courtyard Marriott - 3925 Collins Ave. Crescent - 1420 Ocean Dr. Crest Hotel - 1670 James Ave. Crystal Beach - 6985 Collins Ave. Croydon Hotel - 3720 Collins Avenue Seagall Hotel (Old Days Inn) - 100 21st St. Days Inn - (Lexington) 4299 Collins Ave. Days Inn - 7450 Ocean Terr. Deauville Resort - 6701 Collins Ave. Deco Walk - 928 Ocean Dr. Delano - 1685 Collins Ave. Delores Guesthouse - 1420 Collins Ave. Dezerland - 8701 Collins Ave. Dorchester - 1850 Collins Ave. Dorset - 1720 Collins Ave. Doubletree Grand - 1717 Bayshore Dr. Doubletree Surfcomber - 1717 Collins Ave. Dream - 1111 Collins Ave. Econolodge - 1435 Collins Ave. Eden Roc - 4525 Collins Ave. Edison - 960 Ocean Dr. Edition - 2901 Collins Ave. Epic - 270 Biscayne Blvd Way Essex House - 1001 Collins Ave. Fairwind - 1000 Collins Ave. Fashionhaus - 536 Washington Ave. Fontainebleau - 4441 Collins Ave. Freehand Miami - 2727 Indian Creek Drive Gansevoort - 2377 Collins Ave. Gale Regent South Beach, 1690 Collins Ave. Grand Beach - 4835 Collins Ave. Grandview - 5900 Collins Ave. Haddon Hall - 1500 Collins Ave. Harrison - 411 Washington Ave. Hawaii - 7430 Ocean Ter. Hilton - 1601 Biscayne Blvd. Hilton Bentley - 101 Ocean Hilton Vacation Club - 1430 Ocean Drive Holiday Inn - 340 Biscayne Blvd. Holiday Inn - 4333 Collins Ave. Hotel Eva - 1506 Collins Ave. Hotel Ocean - 1230 Ocean Hyatt Centric - 1600 Collins Ave Hyatt Regency - 400 SE 2nd Ave. Impala - 1228 Collins Intercontinental 100 Chopin Plaza International Hostel - 236 9th Street Jazz - 321 Collins Ave. Joe's Stone Crab 11 Washington Ave. JW Marriott - 255 Biscayne Blvd. Way Kent - 1131 Collins Ave. La Costa - 5333 Collins Ave. Loews - 1601 Collins Ave. Lombardy Inn - 6300 Collins Ave. Lorraine Inn - 2601 Collins Ave. Majestic - 660 Ocean Marco Polo (RAMADA) - 19201 Collins Ave Marlin - 1200 Collins Ave. Marriott Biscayne Bay - 1633 Bayshore Drive Marseilles - 1741 Collins Ave. Mercury - 100 Collins Metropole - 635 Collins Metropolitan - 2445 Collins Ave Miami Beach Resort - 4833 Collins Miami Hostel - 810 Alton Road Mimosa 6525 Collins Ave. Monaco - 17501 Collins Ave. Lords Hotel - 1120 Collins Nassau Hotel - 1414 Collins Ave. National - 1677 Collins Ave. New Hotel - 7337 Harding Ave. Newport Beach Resort - 16701 Collins Ave. Ocean Five - 436 Ocean Drive Ocean Blue Hostel - 928 Ocean Dr. Ocean Grande - 3651 Collins Ave. Ocean Pavilion - 5633 Collins Ave. Ocean Reef Suites - 1130 Collins Ave. Ocean Surf - 7436 Ocean Terrace Ocean Terrace - 7410 Ocean Terrace Ocean Way - 7430 Ocean Terrace Oceanspray - 4130 Collins Ave. Palmer House - 1119 Collins Ave. Palms - 3025 Collins Ave. Park Central - 640 Ocean Dr. Pelican - 826 Ocean Dr. Penguin - 1418 Ocean Dr. President - 1423 Collins Ave. Princess Ann - 920 Collins Ave. Raleigh - 1775 Collins Ave. Ramada - 19201 Collins Ave Red - 3010 Collins Ave. Richmond - 1757 Collins Ave. Ritz Carlton - 1 Lincoln Rd. Riu - 3101 Collins Ave. River Park - 100 SE 4th St. Riviera - 2000 Liberty Ave. Rodeway - 7430 Ocean Ter. Royal Hotel - 763 Pennsylvania Ave. James Royal Palm - 1545 Collins Ave. Sagamore - 1671 Collins Ave. Sanctuary - 1745 James Ave. San Juan - 1680 Collins Ave. Savoy - 425 Ocean Dr. Sea View - 9909 Collins Ave. Seacoast Towers - 5101 Collins Ave. Sense - 400 Ocean Dr. Seagull Hotel - 100 21st Street Setai - 2001 Collins Ave. Shelborne - 1801 Collins Ave. Shelley - 844 Collins Ave. Sheraton Four Points - 4343 Collins Ave. Sherbrooke - 901 Collins Ave. Shore Club - 1901 Collins Ave. Sixty Sixty - 6060 Indian Creek Dr. Solara Resort - 8801 Collins Ave. South Beach Hostel - 235 Washington Ave. South Beach Hotel - 236 21st St. South Beach Marriott - 161 Ocean Dr. South Seas - 1751 Collins Ave. Starlite - 750 Ocean Dr. St. Augustine - 347 Washington Suites on South Beach - 1330 Collins Ave. Tempo Miami - 1100 Biscayne Blvd. The Hotel - 801 Collins Ave. Thompson Miami Beach - 4041 Collins Avenue Thunderbird Hotel 18401 Collins Tides - 1220 Ocean Dr. Townhouse - 150 20th St. Traymore - 2445 Collins Ave. Tropics - 1550 Collins Ave. Venezia - 3865 Indian Creek Dr. Versailles - 3425 Collins Ave. Villa Bagatelle - 220 21st Street Villa Paradiso - 1450 Collins Ave. W South Beach - 2201 Collins Ave Waldorf Tower - 860 Ocean Dr. Wave - 350 Ocean Dr Westgate Resorts - 3611 Collins Ave. Westover Arms Hotel - 4100 Collins Ave Whitelaw - 808 Collins Ave. Winterhaven - 1400 Ocean Dr. Wyndham Garden - 1050 Washington Ave. Wynwood South Beach - 1051 Collins Yve - 146 Biscayne Blvd. Z Ocean - 1437 Collins Ave.
Tour Description: The Miami Double Decker City Tour by Bus + Miami Boat Tour + Half Day Everlgades Tour. The open top doube decker bus tour will explore all of Miami Beach, Downtown, Financial District, Coconut Grove, Coral Gables, & Little Havana. 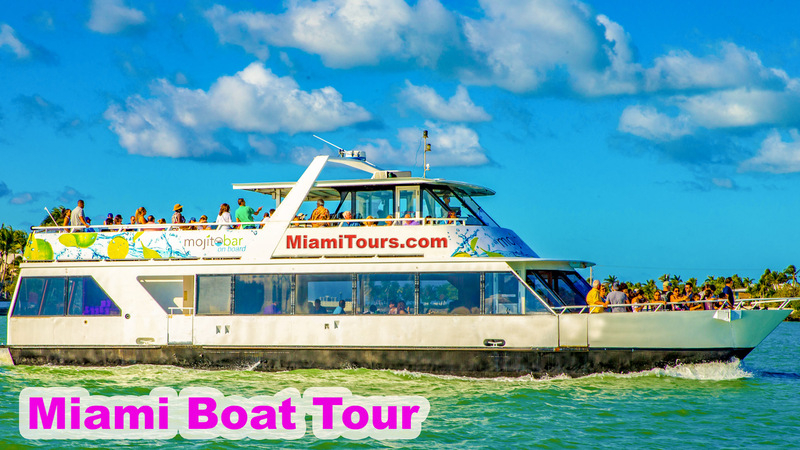 Also you will hop on a boat the will cruise the Biscayne Bay and all of Star Island, Palm Island, Hibiscus Island and all the homes of the rich and famous. After you will go to the Everglades and explore the Everglades National Park. 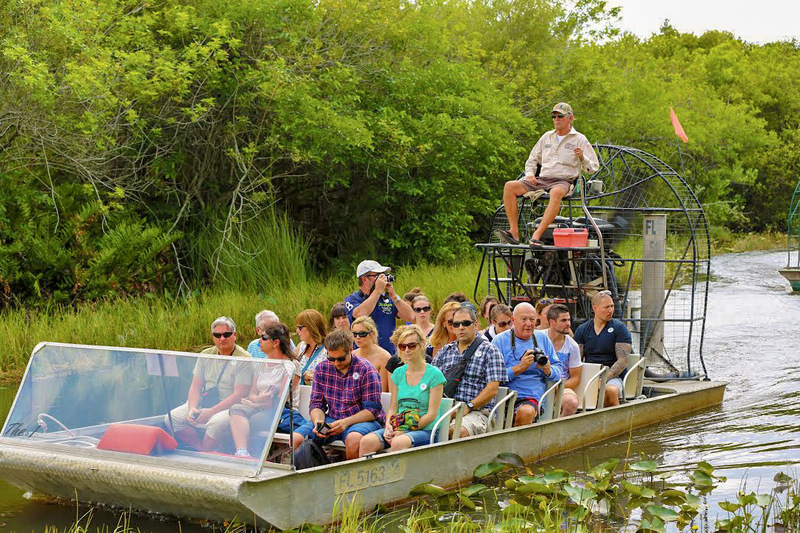 Hop on a airboat tour and explore the whole Everglades. We do offer hotel pick so if you purchase it online, after booking it please give us a call so we can schedule a hotel pick up. If your staying at south beach, you are more than welcomed to come to the store for the departure. Miami Double Decker is one of the largest independent travel agencies in Miami. Serving both the luxury and budget travelers, we help you plan your tour astonishingly. Our major focus is on group and individual tours, destination tours and adventurous vacations.For years now, we have been serving vacationers and have made a mark for our consumer relationship-building. What sets us apart from others is our devotion to pragmatic travel with unique tours, basically designed for each client’s budget and style. Visit Miami without worrying about details like hotels, meals, transfers, sightseeing and more. Leave all that to us and set for an amazing journey. At Miami Double Decker we consider in letting you select from our diverse range of group tours. Our travel experts will make sure that you have the most memorable and enjoyable tour. Additionally, you’ll also get ample time to explore the Magic City on your own pace. With us, you’ll be traveling with a group of like-minded individuals. Group tours are not only pocket-friendly, but they also allow you to make new friends and share your experiences with them. Whether you are eyeing a holiday with more time in hand or are keener to choose a short-trip, at Miami Double Decker you’ve several choices to match your taste. You may have always longed to have a family vacation or your own private group tour. Miami Double Decker gives wings to this dream of yours! Here, you are the designer and we’ll be the tailor. More specifically, our travel experts will understand your need and tailor-make the tour for you. What Tour Choices You Have? At Miami Double Decker, you have the freedom to choose from a wide array of tours such as Miami Double Decker Bus Tour, Miami Boat Tour+ Transportation, Key West 1 Day Tour, Miami Boat Tour+ Ticket Only, Segway 2 Hour Tour, Segway 2 Hour Tour, Everglades Airboat, Segway 1 Hour Tour, and Double Decker Bus Tour+ Miami Boat Tour. Board our open-top bus and travel in comfort. Double Decker Tour is a highly appreciable tour choice among vacationers. Our team works thoroughly to help you with some of the exciting tours ever. Loaded with enthralling sights, our tours give you the chance to explore Miami in the most incredible way. Our tour departs twice daily and starts from South Beach’s Historic Art Deco District. En route, you can hop-off at Downtown, Miami Beach, Coconut Grove, Little Havana, Bayside and Coral Gables. Led by professional guides, we assure you a safe transfer from one location to the other. And the extraordinary sightseeing choices that you see on your way are simply mind-blowing. Experience the freedom of hopping on and off with our tours. Hop-off at any place that peaks your interest, click awesome pictures and then re-board another bus to continue with your journey. You can make online reservations as well. By applying online you can grab a pleasant discount. Join the league and prepare to have a wonderful time. 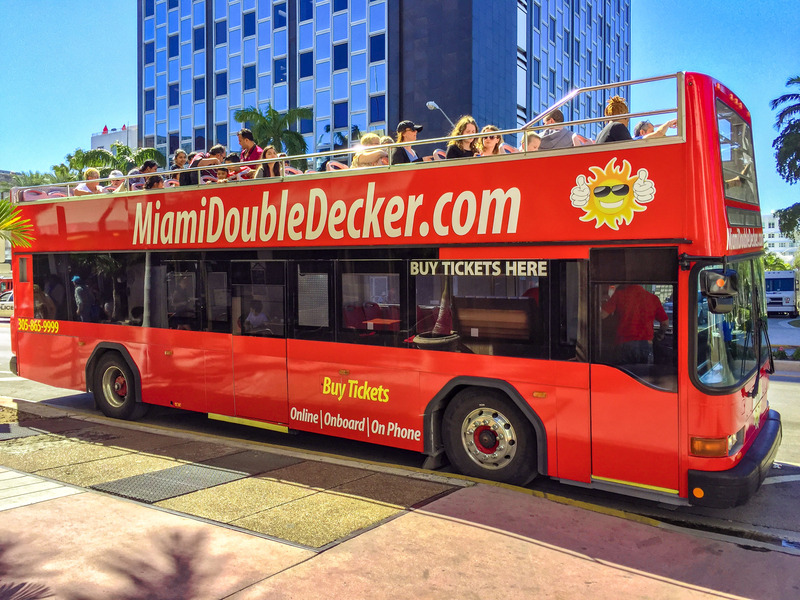 Miami Double Decker offers an awesome Miami City Tour for just $25 per Person. The Tour covers, Miami Beach, the Art Deco Neighborhood, Downtown Miami, Little Havana, Coconut Grove, Coral Gables and Bayside. Riding on top of the Double Decker Bus was really cool.